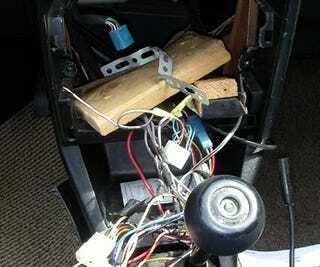 Question of the Day: Worst Car Hack You've Ever Seen? I knew I was in trouble when I saw the upholstery tape used as trim around the fritzy JVC deck, but even then I was unprepared for the ensuing Rube Goldberg nightmare that followed when I pulled off the bezel; it was like opening your fridge to grab a beer and finding a rotting raccoon carcass crawling with maggots in the crisper drawer. Plywood. Lots of plywood. Plumber's tape. Scotch tape used for insulation. Drywall screws galore, including several 2-inchers screwed through the body and into the guts of the stereo. It goes without saying that the whole mess was powered by a lead running straight to the battery (unfused), with the original factory harness slashed randomly and dangling in the midst of the mess, its own hot wires straining eagerly for the nearest ground. The factory speakers were bypassed and about 50 feet of new wires run a complicated path under the carpeting to speakers wedged behind the back seat cushions. So then I had to shoot several precious weekend hours through the head, tearing out Rube's handiwork, fixing the factory wiring, etc, because the car's owner was a friend who'd done me a lot of favors over the years, plus now the Car Gods wanted to punish me for thinking all Toyota stereo installations are easy. And you can't blow off the punishments of the Car Gods. All in all, not that bad a previous-owner car hack job, certainly seen worse (e.g., gas tank replaced with 5-gallon can belted into back seat, tiny space-saver spares on all four corners of a car driven that way from Seattle to San Francisco, etc. ), but it got me to thinking about the whole genre of dangerous/stupid car hacks (distinct from yet related to stupid/dangerous house hacks). The evil beauty, their insights into the fallibility of the human intellect, the rage you feel when you realize you've almost been offed by one. So now it's time for you, faithful readers, to share your no-doubt-amazing wealth of car-hack stories. Maybe they're hacks you inherited from a previous owner, maybe they're hacks you ran across in the vehicles of others, or maybe they're hacks you perpetrated yourself and now have the ferrous nodules to share with us. Bonus points for anything involving Warsaw Pact vehicles, of course.